PEERLESS BASICS: With superior fabric, innovative sizing, and unique colors, it's time to refill your hats drawer with these peerless basics. The look and feel of premium cotton meets modern performance. STAY SAFE UNDER THE SUMMER SUN: Stop risking your health and safety by walking outdoors without adequate sun protection. 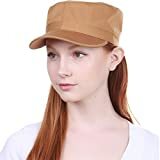 Protect your skin from harmful UV rays and keep your hair out of your face and eyes by wearing this comfortable cap during all your outdoor activities. Made of breathable, 100% high quality cotton, it is the perfect companion for your active lifestyle. 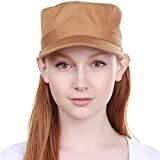 Interested in the KBK-1464 TIM L Cadet Army Cap Basic Everyday Military Style Hat? Is the price too high? You can easily price watch this product and we'll notify you when the price reaches your target.